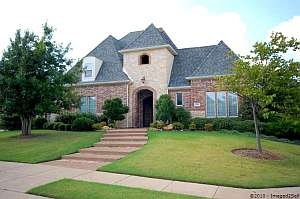 Prosper TX Homes For Sale, Priced $50k under Market – Custom home on corner lot in golf community. Gourmet island kitchen with granite has double oven, wine rack, and breakfast bar. Spacious master retreat has tray ceiling, oversized shower, jetted tub, granite vanities, and large walk-in closet. Designer touches include Plantation shutters, skip trowel walls and crown molding. Floor to ceiling stone fireplace. Built-in grill and outdoor fountain. 4th bedroom in guest quarters with separate entry..
Click here current status, pricing, photos, and a virtual tour. After several days of heavy rain in the Dallas – Fort Worth Metroplex I was out looking around my home. I discovered fire ants building nests up the foundation and entering my home through the weep holes in the bottom course of bricks. The heavy rains have all kinds of things looking for dry ground! I often tell our clients to watch their foundations for signs of termites building tubes, but I’m reminded that checking it after a heavy rain is also a good idea. While fire ants are not necessarily a wood-destroying insect, I don’t want to share my home with them either! I treat fire ant mounds in my yard with a granular fire ant killer but prefer liquid when treating the foundation. You can hire a professional to spray for you or you can purchase a small sprayer and the chemicals at your local home supply store. It’s been a long, hot, dry summer in the greater North Texas area this year. While this is not all that uncommon, an extended period of it takes its toll on homes and our water supply. The vast majority of foundations built in the past forty years are post-tension slabs on grade. Combine post-tension slabs with expansive soils and you have a recipe for lots of foundation movement. Basically the foundations float on the expansive soil and are held together by the post-tension cables in the concrete. It’s not unusual for there to be minor cracks in the interior sheetrock as there is always some movement in the slab. When we have an extended period with little to no rain, the soil around the outside of the slab dries out and contracts while the soil in the center of the slab remains wet and expanded. The foundation is high in the center and low on the ends. If it gets bad enough, the foundation will settle and crack. Foundation engineers recommend soaker hoses along the foundation to assist in keeping a constant moisture level in the soil around the slab. This summer, it added about $100 per month to my water bill trying to keep the slab watered. It was so bad this summer that the entrances to Ridgeview Ranch were damaged and had to be replaced. It’s the Texas version of a frost heave. We’ve had heavy to moderate rain for the past 24 hours. This is a welcome sight. It will green up the lawns, stabilize our homes, and refill our local lakes that are also our primary source of drinking water. I’ve been reading all the blogs lately talking about what’s wrong with the profession. People want to raise the bar for entry into the profession because they believe that higher education and training is answer to the public perception problem. I have advocated that the answer lies in holding the brokers responsible for the activities of his/her agents and that we need to hold each other to a higher standard of practice. While both of these would help curb the unethical practices that cause much of our problem, it would only do so retroactively. What we really need is a test for a person’s ethical compass. If only there was a way to determine what people would do in a number of given situations prior to licensing we could effectively weed out the undesirable people long before they could cause problems for the rest of us. It sounds a bit like the “Precogs” in Stephen Spielberg’s “Minority Report.” The “precogs” could “see” a murder before it happened and the police were able to arrest the person for a crime that would have happened in the future. As a result there had not been a murder in Washington DC for a number of years. While Pre-Crime appears to have created a Utopia of sorts, we find out just how flawed it really is when the “precogs” see the character played by Tom Cruise commit a murder. In the end he does not commit the murder and the flawed system is terminated, all those convicted of pre-crimes are released, and the “precogs” live out their lives on a small island isolated from people. Sadly we can’t test for a person’s ethical compass. What we can do as a group is to watch for people who act unethically and then file complaints with the appropriate association or state licensing board. Until we start to really self regulate our collective behavior, we’re not going to solve the public perception issue. PS – Updated moral to ethical. 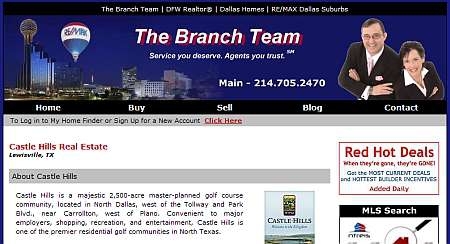 Castle Hills is a majestic 2,500-acre master-planned golf course community, located in North Dallas, west of the Tollway and Park Blvd., near Carrollton, west of Plano. Convenient to major employers, shopping, recreation, and entertainment, Castle Hills is one of the premier residential golf communities in North Texas. In addition to an ideal location, Castle Hills has unrivaled amenities and a small-town feel. The Castle Hills Golf Club is home to the 18-hole, Jay Morrish-designed course and club with dining, pro shop, meeting rooms and teaching academy. Throughout Castle Hills, there are parks, lakes, a hike-and-bike trail and community centers with swimming pools, basketball and tennis courts, fitness rooms, ball fields and more. The updated Castle Hills Real Estate website includes information about the area, new homes, and homes for sale.